We’d love your help. 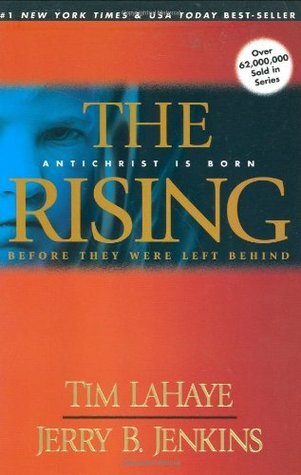 Let us know what’s wrong with this preview of The Rising by Tim LaHaye. Halfway around Marilena Carpathia has only one dream: to be a mother. So when a mysterious clairvoyant promises the fulfillment of this dream, Marilena does not hesitate. Through genetic engineering and the power of the prince of darkness himself, Marilena is about to become a chosen vessel, one who will unknowingly give birth to the greatest evil the world has ever known. Halfway around the world, God s plans are subtly being carried out too. Young Ray Steele is determined to avoid one day taking over the family business. Instead, Ray sets his heart on becoming a pilot. . . . Soon Carpathia s and Steele s lives will intersect. And good and evil will clash in an explosion that will shake the world. So I read the Left Behind series back in 2011. I want to re-read all 13 books. Since I didn't have a Goodreads account back then, I had no idea there was 3 prequel books. Does anyone suggest reading the prequels first, even though they came out after the 13 Left Behind book series?? Or should I just read the Left Behind series before the 3 prequels?? Just looking for a recommendations on this. Thanks! I had a hard time deciding whether or not to give this book 2 stars or 3 stars. If I could give it 2.5, I would -- so let's just say I rounded up. To start with, the quality of writing is abysmal. I could not help but be annoyed every time the authors tried to make the characters sound more... I dunno, "ethnic" perhaps... by peppering in foreign words, and then immediately having the character repeat the word in English in the following sentence. It was as if they had never heard of context befor I had a hard time deciding whether or not to give this book 2 stars or 3 stars. If I could give it 2.5, I would -- so let's just say I rounded up. To start with, the quality of writing is abysmal. I could not help but be annoyed every time the authors tried to make the characters sound more... I dunno, "ethnic" perhaps... by peppering in foreign words, and then immediately having the character repeat the word in English in the following sentence. It was as if they had never heard of context before. Furthermore, every time God entered the conversation, I felt like I was being preached at. Because, you know, there is only one correct way to worship God. Right? Secondly, the stories of Rayford's youth drove me berserk. He was the smartest, fastest, cutest, and most athletic boy in his school. He was the coolest, most popular kid... in FOURTH GRADE. Really? On top of that, he develops shame of his parents because they are not rich and don't drive fancy cars. All of that from a 9-year-old? I have taught all ages from kindergarten on up, and while I have no doubt that 9-year-olds can be sassy, his character just seemed far-reaching. That type of self-centered materialism doesn't seem to fully entrench itself until kids hit 7th grade or so. The one thing I appreciate about this book is the character of Marilena. I have read the entire series, and hers is the ONLY character I have ever actually cared about. She seems more conflicted, more human, more deep than any other character in the series. I found myself feeling truly sorry for her at some points, and feeling relief when she turned to God. I also think they did a pretty good job with Carpathia's back story. No doubt that it, too, is a little far-fetched, but we're talking the end of the world here. Normality is out the window. Anyway, while some of his outright cruel actions made me squirm, it definitely sets the stage for his becoming the anti-Christ. I'll apologize in advance for the brevity of this review. I would love to do this book justice, but it's that time of the semester when I don't have much time for anything, so rather than touching on some points and ignoring others, I'll stick to generalities in this review. Because of the blatant Christian message of the Left Behind series there's a tendency to stereotype them, but if you've already read the original series, you're already aware that these aren't your typical "feel good" Christ I'll apologize in advance for the brevity of this review. I would love to do this book justice, but it's that time of the semester when I don't have much time for anything, so rather than touching on some points and ignoring others, I'll stick to generalities in this review. 3.5 bumped up to 4 because I'm feeling generous. This was a random pick off the library shelf, an attempt to try something new. At the time I had no idea it was a prequel to another very popular series, The Left Behind series. It was okay in a Rosemary's Baby kind of way. The writing was good enough and the characters were interesting enough. The book kind of ends without ending, which didn't make sense until I later read that this was a prequel. I liked it enough to read the second book and/or try t 3.5 bumped up to 4 because I'm feeling generous. I liked it enough to read the second book and/or try the Left Behind series. Bought at Commerce Public Library book sale, but plan to donate back to library when finished. I enjoyed this one. It's back to the quality of the original series when it started out. I think Marilena Carpathia is the best developed character the authors have come up with. She's a very sympathetic character, even though she chooses the wrong side at first. There is a very poignant scene where she discovers the mistake she made and finds out what has really been going on. It's interesting to disco Bought at Commerce Public Library book sale, but plan to donate back to library when finished. I had several things to say about this book, but now that I've read the remaining ones I can't remember the specific yays or nays. I can say, however, that The Rising is interesting in an informative way. We learn about the anti-Christ's parentage and more background on key Left Behind characters. But overall, it lacks any major climax. It feels more like a book laying out a history of certain characters rather than telling an actual story. Most Christians will admit that if they were old enough or a part of the contemporary Christian culture of the 1990s and early 2000s that they read some of the Left Behind series. I'll be that guy and say I did read at least the first four books of the Left Behind series way back when they started coming out. But, as the years went on I lost interest. Probably the rebelliousness of the college years or the decision to part ways with the cheesiness of some of the Christian pop-culture of the time Most Christians will admit that if they were old enough or a part of the contemporary Christian culture of the 1990s and early 2000s that they read some of the Left Behind series. I'll be that guy and say I did read at least the first four books of the Left Behind series way back when they started coming out. But, as the years went on I lost interest. Probably the rebelliousness of the college years or the decision to part ways with the cheesiness of some of the Christian pop-culture of the time. About a week ago I was searching for a fun fiction book to read that had a sci-fi or thriller twist. For some reason Left Behind popped in my head and I thought, "Why not?" Turns out that they have added three books as a prequel to the original Left Behind book and so there would be an incentive to trying the series again. I am into a lot of the crime, thriller, sci-fi and dystopian books that are popular today and I have to admit, this first book in the 17 book series is GOOD. I am not kidding! What works for this book? The writing and character development is excellent. The suspense and drama of the book is one that could be seen in a blockbuster movie or primetime show. The book follows (no spoilers) Nicolae Carpathia and Rayford Steele from childbirth to almost where the original first book in the series starts. We learn the backstory to these characters and it is really fleshed out well. Do you need to know the characters going into the prequel series? No. But it is helpful to know where you are going. We know that the whole series is based on the end-times (no surprise here) according to the Christian faith, so expect some Christian vocabulary. Also know that we are following the two characters for a reason. If there is any flaw in the book, it is that there is no set-up early on as to why the reader is following the two different stories, but if you can hold off to the last half of the book, you will begin to understand what roles these men will play in the future. Why is it 5 stars? Like I said above. Excellently written. Creepy story. Not a cheesy Christian writing. In fact, it is a little violent and intense. My favorite thing is the emotion I built for the characters. I felt happy, upset and horrified for them in various chapters. I think you will get wrapped up in the story too. I have read the entire Left Behind Series and am now reading the books that take place before the rapture. In the first, we follow the life of young Rayford Steel. It starts when he is approximately 9 years old and takes us through his marriage and the birth of his two children. Ray is smart, athletic, and good looking. He knows what he wants (money, nice house, nice cars) and is willing to work hard to achieve all his dreams. We also follow the birth and young life of Nicholae Carpathia. Compar I have read the entire Left Behind Series and am now reading the books that take place before the rapture. In the first, we follow the life of young Rayford Steel. It starts when he is approximately 9 years old and takes us through his marriage and the birth of his two children. Ray is smart, athletic, and good looking. He knows what he wants (money, nice house, nice cars) and is willing to work hard to achieve all his dreams. We also follow the birth and young life of Nicholae Carpathia. Compared to Rayford's life it is very disturbing. His mother and "aunt" worship Lucifer (although his mother sees the error of her ways towards the end of her life). Even though Nicholae is smart beyond his years and very athletic, he uses these gifts to his advantage and doesn't care who he hurts. He is incapable of showing love, even to his own mother, and everything about him is cold. I read the Left Behind series of books many years ago, but had never read the prequel books. That is what I am doing right now. This was written in the same style as the original series, but explains the characters who we meet in the first book of the series when the Rapture took place. I am in a Revelations Bible study, so I am reading these books in light of what I've learned through the study. I'm enjoying them very much. I read all of the Left Behind books and thought they were amazing ... this book now has filled in some of the parts that were missing. It is about the two men in the books ... Nicholae and Rayford. It is the story of their childhoods and how they came to be who they were. You have to have read the prior Left Behind books for this all to make sense. What a wonderful book!!! I read this book after some prompting from an avid-reader friend. I haven't read many fictional works dealing with the Rapture or the Anti-Christ. It is an intriguing topic that makes you wonder, what WILL happen when this world, as we know it, comes to an end? This was honestly just as interesting and compelling as the original Left Behind series. I will say that this book in particular has some very creepy and harrowing parts if you are a Christian so I would tread carefully not to be too distracted or interested by the representation of a false god that takes place in this as a part of Nicolae’s origin story. I do think it’s handled well by the authors in showing the dangers and what it does to a life that becomes entrapped in such things. I 4 stars! This was honestly just as interesting and compelling as the original Left Behind series. I will say that this book in particular has some very creepy and harrowing parts if you are a Christian so I would tread carefully not to be too distracted or interested by the representation of a false god that takes place in this as a part of Nicolae’s origin story. I do think it’s handled well by the authors in showing the dangers and what it does to a life that becomes entrapped in such things. It is also a powerful representation of the full redemptive power of God’s mercy and that it’s never too late to receive his grace and to invite him into your life. I found the struggle that Rayford’s childhood friend tried to impress upon him when they were kids that was also addressed later in the story when Irene had meetings with with her friend was a very compelling and great way to represent the fact that people are searching for something more even if they are already avid churchgoers. The clear push that there is something more to a relationship with God than just going to church is clearly shown on the page as well as the internal struggle with those who are being reached out to and how they may feel attacked or judged when people come up to them and try to share that truth. These books do such a great job of making you take a step back and evaluating your own relationship with God and speaking truth into so many people’s lives. I'd like to start with for anyone who is looking into reading this book I would strongly recommend it. I have not read the Left Behind Series yet but I thought to read these first before professing to the rest. I would also like to state that I am not a devout Christian. I worried that these book would have a strong Christian biasis making feel badly for what i believe...or do not but I have not ran into that which was a definite plus. I enjoy books where there is good vs. evil and I like the bi I'd like to start with for anyone who is looking into reading this book I would strongly recommend it. I have not read the Left Behind Series yet but I thought to read these first before professing to the rest. I would also like to state that I am not a devout Christian. I worried that these book would have a strong Christian biasis making feel badly for what i believe...or do not but I have not ran into that which was a definite plus. I enjoy books where there is good vs. evil and I like the biblical references even if I do not believe in the Christian faith. Ray Steele is the main character along with Nicholae and his mother Marilena Carpathia. The beginning of the book goes back and forth between the adolescent Ray Steele and Marilena Carpathia as she searches for her spiritual side and her strong need for a child. As an adolescent, Ray see his rich friends who have a stronger religion base that believes in the strong fear of hell if the bible is not followed word for word. Ray is ashamed of his home life with his hard working middle class parents who are older then the rest of his friends' parents. He finds it unfair that he has this life since he is one of the most handsome, athletic, and smart children at his school. His dream is to fly and he will let nothing stop him from attaining that dream. He works hard and school and through the ups and downs of his looks and athleticism he always has good grades and with the help of his father (who's real dream is to have Ray take over his shop) gets him his flying licence by the age of 18. While this is going on Marliena Carpathia is a professor at an Romanian school with her husband. The do not share a strong bond but she finds a way to get him go to a group with her that she feels compelled to go to As she is there she feels like the Clairvoyant Viv is talking directly to her she takes a greater interest in the group and continues to attend. As Marliena's need for a child deepens Viv explains to her that she has a way to give her that child. She will be a vessel for Nicholae that victor for the people. Marliena tells her husband and he agress to give the child his name if he can get a divorce for the man that he really loves. Marliena is skeptical at first but the legion finds a way to get her to accept their gift and 9 months later in the middle of no where she gives birth to Nicholae. 10 years pass and Marliena is unhappy with her situation. She has a son that neither respects her nor acts like a normal child. He is wise beyond his years and he knows it. He knows he a very special and as Marliena tries to devout herself to Lucifer she expresses that she cannot lie to herself. Viv howeever is a very devout member of the group and raises Nicholae in their faith. Marliena becomes expendable even to her cold hearted son. Nicholae aggravates her to a point of rage and as Marliena longs to punish her son he bites her so hard she is forced to go to the hospital. Upon a rival she is fixed quickly and sent on her way. But the legion has heard about the transgression and are sending her son and Viv away to get away from her. As she sits in the home alone she finds many deep dark secrets and starts to realize she is not going to make it out alive. Her whole live has been planned by someone else. Her former husband had been hired to find her. It has all been part of a master plan to give his name to her boy and make her be the vessel for the greatest evil that will walk this earth. She continues and sees that Viv never had her interest at heart and that the bite had been a plan by her son to get away and actually poison her while at the hospital. As the doctor makes a house visit she realizes he is there to finish the job. As he tries to place the syringe into her arm she grabs the gun and blows his head off buy not before the syringe injects the poison into her body. In her final moments she truly believes in God and asks him for forgiveness and asks him to bring her home. When Nicholae is taken away he feel so remorse or sadness for his mother. He enjoys his time away and in the following years while Ray Steele is working his way through school Nicholae is learning and becoming one of the smartest men in the world... and as always he knows it. He eventually becomes so high and mighty he starts to take on the legion telling them what to do and starts to become the richest man in the world as he brutes his way to the top of the company. Finally a dark figured man who I assume is Lucifer comes to him and asks him if he is a God. As he smugly assumes so the figure leaves him in the dessert for 40 days and 40 nights. Just as he is about to give up the figure comes back and puts him through 3 tests which he passes and now he is sure that he is truly a God. While the raising of Nicholae and his rise to greatness proceeds Rayford goes to college on an ROTC scholarship and is still one of the most attractive men on campus. He is not rich though so he doesn't go the typical path of the Frat guy. He concentrates on his studies and his main goal is still to become a pilot. As he goes through school he meets Kitty, a pretty, self-absorb sorority girl that Ray cannot stand but cannot lead. She convinces Ray to do anything she wants and forces the relationship to move to quickly, even going as far as picking her ring and forcing him to buy it without even a proposal. Ray's best friend Irene explains that he has to call this off and stop lying to Kitty and himself. In this time Rayford finds he is in love with Irene and after ending things with the gorgeous Kitty he marries Irene and have a baby shortly after. Ray is working toward his dream in the air-force getting a lot of air time when he finds out that his father has Alzheimer and is deteriorating quickly. His mother asks him to pray but he doesn't believe it will work. Him and Irene have that in common. After her dad and bother died and countless prayers gone unanswered she didn't feel like there was a point. But upon the birth of their daughter she decides they have to try a church for her. Ray becomes a pilot and after a close call he starts to believe that maybe his prayers were answered, and Irene's encounter with her friends leads her to let God into her heart. The theme of the book is the birth, childhood, and early adulthood of the Antichrist. I enjoyed the chapters that focused on the lives of Rayford and Irene Steele as well. But the bulk of the book, rightfully so, focuses on the early life of the Antichrist. The Bible has much to say about the Antichrist, although the Apostle John (the one who uses the term in the New Testament) only uses it a few times. Nonetheless, there are over 100 passages in the Bible that give a large amount of detail about The theme of the book is the birth, childhood, and early adulthood of the Antichrist. I enjoyed the chapters that focused on the lives of Rayford and Irene Steele as well. But the bulk of the book, rightfully so, focuses on the early life of the Antichrist. I needed to read this book for school. I wouldn't normally pick up this kind of book. I have mixed feelings. I don't personally like anything that is preach-y. Religion is all fine and good, but don't try to tell me I'm going to hell because I believe something different. The story is rather jumpy, there are a lot of characters to follow. Not bad, can just get confusing sometimes trying to match up time lines. I did enjoy the storyline of Marilena, I wish that was a story on its own, with more de I needed to read this book for school. I wouldn't normally pick up this kind of book. I have mixed feelings. I don't personally like anything that is preach-y. Religion is all fine and good, but don't try to tell me I'm going to hell because I believe something different. The story is rather jumpy, there are a lot of characters to follow. Not bad, can just get confusing sometimes trying to match up time lines. I did enjoy the storyline of Marilena, I wish that was a story on its own, with more details and background and less bible verses. Enjoyable and fast-paced! This novel introduces the reader to two characters that will have major rolls in future books in this series. Along with the information gleaned about them, the story is very impactful regarding Marilena and the choices she makes. The book lends itself to plenty of discussion, especially regarding Marilena's future. I can not say enough good things about this book. I am so excited to read this complete series all the way through. It really makes you think of how things could be with the Antichrist. Two thumbs up!!!! The story is enjoyable in its frame. But the editing is horrible. Spacing and paragraph structure are horrible. It made reading this story a chore. One I left unfinished as the mistakes ruined my being able to get into the story. It has been awhile since I read The Left Behind series, so it was interesting to read about how Nicolae Carpathia was conceived and who his parents were. I enjoyed reading about Rafe and how he met Irene. I read this book because I loved the Left Behind series. I enjoyed reading about the background of these amazing characters. I loved that the story was compelling and interesting. I thought the novel was well written. It is a must read if you liked the Left Behind series. It is amazing that it seems that we are living in this time right now. I read the original Left Behind series years ago and was given this book as a gift. Maybe because I had already read the others, but this one left me a little disappointed. My favorite one by far! Great book, a bit dragged on at times. But a good enough read.